I will have three pieces in the show. My art is almost always about the physical challenges and transformations of life. I’m very excited about the Shared Vision piece, which I am creating specifically for this exhibit. While making it, I sometimes take off my glasses and just work in the blur. I want to make this a very touchable piece. I plan to do the title for the piece in “braille” done in french knots. I wanted to make the service animal a dragon because it symbolizes a mythic sense of power. I want this piece to be about the power of symbiotic relationships and how our vision is shaped not only by what we see but how we see it. Like all my dolls and cloth sculptures, I’m starting with an idea and figuring out how to put it together. 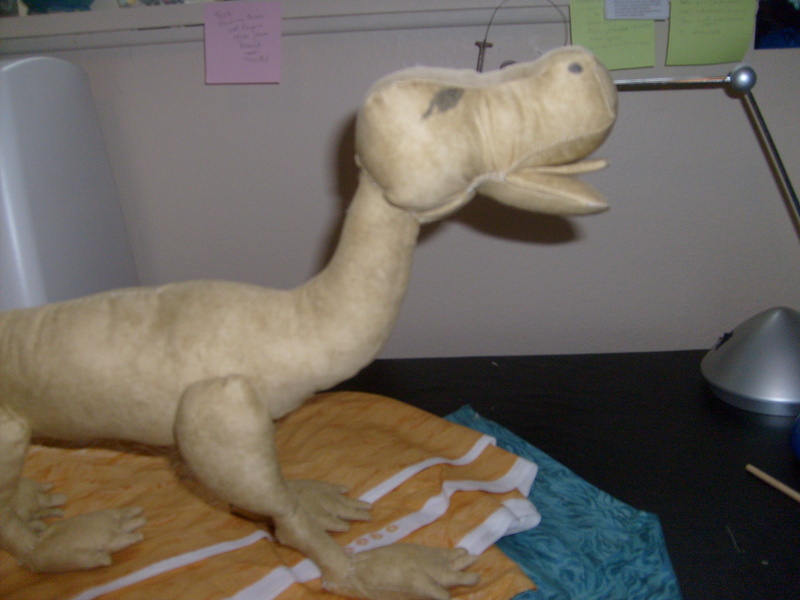 I’ve researched how stuffed animals are made and even made a pretty awful alligator from a a pattern. I didn’t even photograph it and I blame the pattern. But here, at last, is a pretty good “draft” or prototype of the dragon. 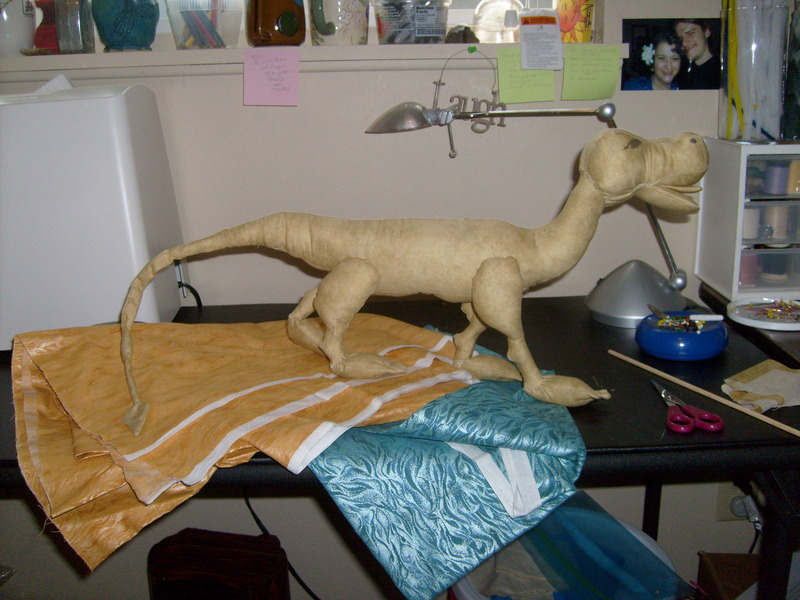 This is without wings or spikes and I’ll probably fatten it up and lengthen the tail, but this is the basic pattern. It’s going to be a combination of a Western and Eastern dragon, as well as having some canine attributes. Her face is detailed with markers here but the visionary dragon will have beaded and embroidered eyes and a painted mouth. 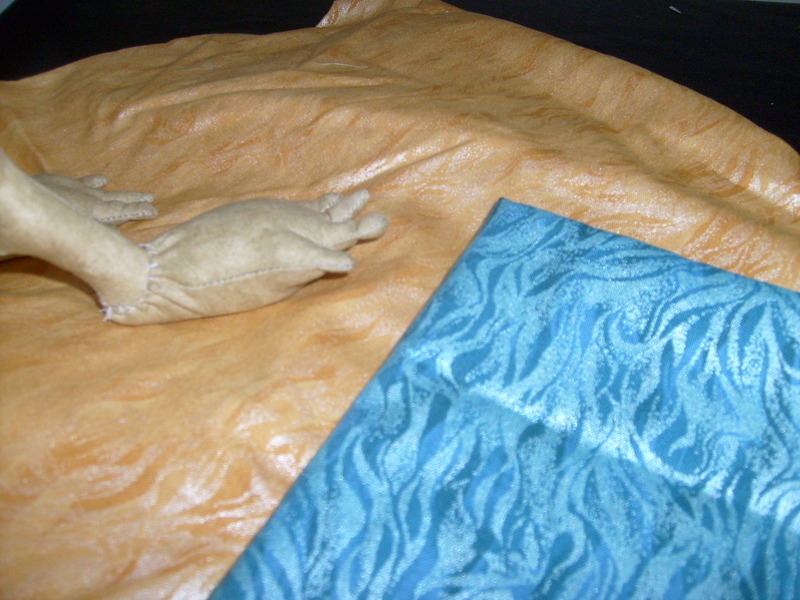 And these are the main fabrics I’ll be using — a pearlized gold with green contrasts. This visionary dragon will take approximately 40 hours to construct and I’ll try to post it at various stages over the next week. Then I’ll build her visually challenged companion. Meanwhile, here’s the website of another artist who will be participating in the show. I love the work of Pat Krishnamurthy who has a wonderful range of styles. I love that she uses quilts as an inspiration and blends together fragments into singular pieces. She has a great sense of color and story and her Archetypes for Aging series is vibrant and compelling.